Southwest setter Angie Aguilar distributes one of her 10 assists. AREA TEAMS INCLUDED: Brackenridge, Highlands, Holy Cross, Jefferson, South San, Southwest. The SAISD Tournament proved to be the perfect ending to an important week of growth for two area teams. Holy Cross (13-1) claimed the gold pool championship and Southwest (9-7) was the silver pool champion in the 15-team tournament that concluded Aug. 22, Each of them was undefeated in four pool-play matches. For Holy Cross, it was the second-consecutive tournament title and third in the school’s history. The Knights were undefeated in six tournament matches, losing only a single game. They finished the week with a 12-match winning streak. The top five finishers in the initial round of pool play Aug. 21 earned spots in the gold division, which was contested at the Alamo Convocation Center. South San (7-7) was fifth in the pool. Southwest won its first championship under new coach Casey Pesek, who coached District 28-6A rival Corpus Christi King last season. 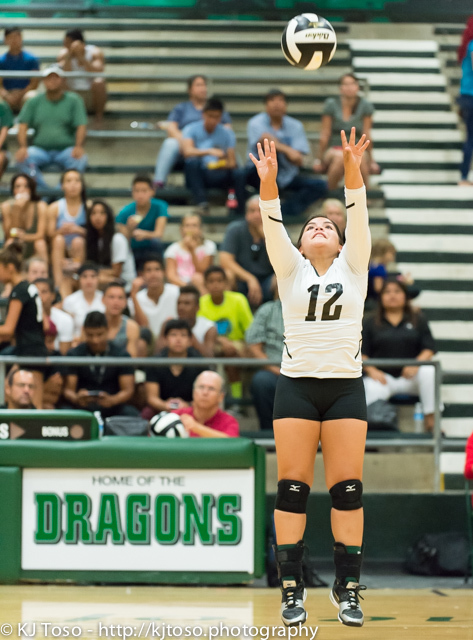 The Dragons swept its pool and were 5-1 in the tourney, losing only to gold runner-up McAllen. Southwest also collected two wins earlier in the week. In the silver pool at Highlands, Southwest was only taken to three games by runner-up Highlands (9-6). The Dragons pulled it out 25-23, 24-26, 25-16. Junior Aashlyn Sulaica registered a kill through a block attempt to give the Dragons an 18-5 advantage in Game 1 against Medina Valley. Despite winning 25-9, the second game was an uphill battle. The Panthers’ lead reached 11-7 before Southwest could wrest control away. A kill from Sulaica followed by a block from Jessica Morales were backbreakers in a 25-19 win. Highlands won won a key three-game match 25-21, 16-25, 25-21 over third-place Southside (7-8). South San was the only team to win a game against Holy Cross after achieving its goal of qualifying for the gold pool. The Knights prevailed 25-19, 23-25, 25-15 in a morning match Aug. 22. “My girls played very well (Aug. 21),” first-year South San coach Evelyn Pineda said. “They were competitive throughout, playing point to point. Brackenridge (5-10) and Jefferson (3-7) each split four games in the bronze pool.